New York: Kodansha International, 1989. 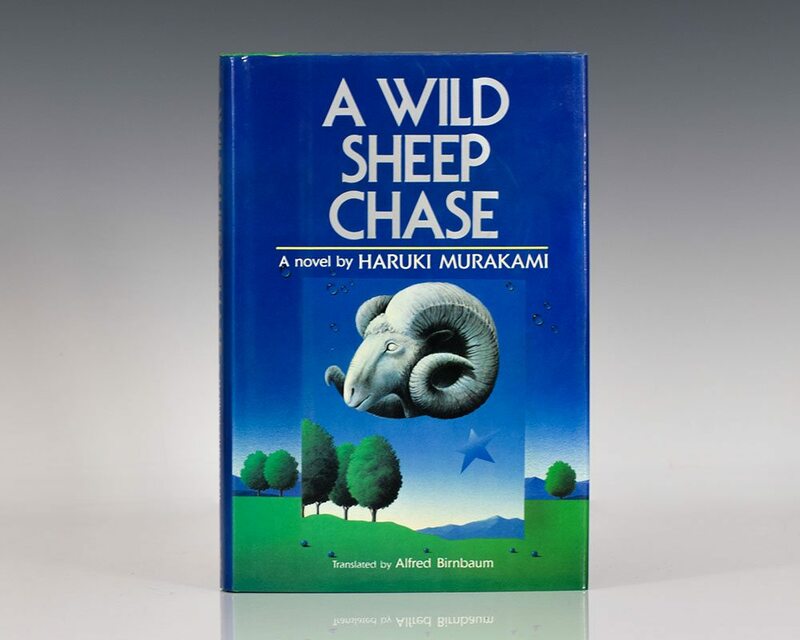 First edition in English of Murakami’s extraordinary literary thriller that launched his international reputation. Octavo, original half cloth. Signed by Haruki Murakami on the title page. Fine in a fine dust jacket. Translated by Alfred Birnbaum. Jacket illustration by Shigeo Okamoto. “Murakami is a mythmaker for the millennium, a wiseacre wiseman" (New York Times Book Review). First editions in English of the author’s most well-known work. Small octavos, original wrappers as issued. Both volumes are fine in fine dust jackets. Both volumes are signed by Murakami, volume one is signed in both English and Japanese and volume 2 in Japanese. Laid in is the original bookmark in volume one. Translated from the Japanese by Alfred Birnbaum. 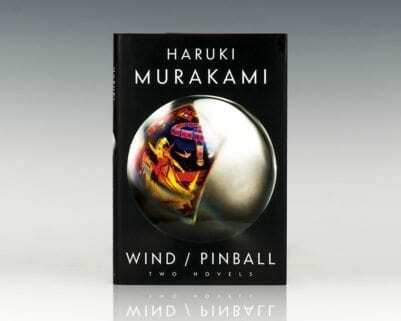 First edition in English of Murakami’s second novel. Small octavo, original wrappers as issued. Boldly signed by Haruki Murakami on the title page. Fine in a fine dust jacket. The wrap-around band is in very good condition. Translated by Alfred Birnbaum. First edition of Murakami’s heroically imaginative novel, which is at once a detective story, an account of a disintegrating marriage, and an excavation of the buried secrets of World War II. Octavo, original boards. Signed by Haruki Murakami on the title page. Fine in a fine dust jacket. Jacket design by Chip Kidd. Translated from the Japanese by Jay Rubin. Hear the Wind Sing (In Japanese). First Japanese edition of the author’s first book. Small octavo, original cloth. Signed by Haruki Murakami on the front free endpaper. Fine in a fine dust jacket, with the rare wrap-around band. Murakami, Haruki; Translated by Jay Rubin. First editions of the author’s most well-known work. Small octavo, original wrappers as issued. Both volumes are signed by Haruki Murakami on the title page. Both volumes are in fine condition and are in the original gold box. Translated by Jay Rubin. New York: Alfred A Knopf, 2006. First edition of this collection of twenty-four stories by Haruki Murakami. Octavo, original half cloth. Signed by Haruki Murakami on the title page. Fine in a fine dust jacket. Jacket illustrated by Chip Kidd. Translated from the Japanese by Jay Rubin. Murakami, Haruki; Seiji Ozawa . 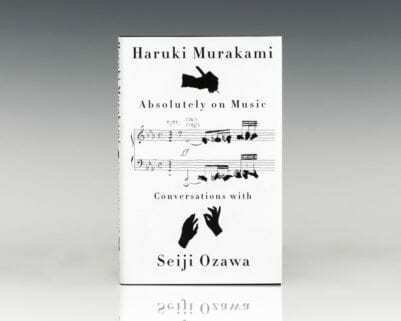 Absolutely on Music: Conversations With Seiji Ozawa. First edition of this deeply personal, intimate conversation about music and writing between the internationally acclaimed, best-selling author and the former conductor of the Boston Symphony Orchestra. Octavo, original boards. Signed by Haruki Murakami on the title page. Fine in a fine dust jacket. Jacket design by Chip Kidd. Translated from the Japanese by Jay Rubin. First Japanese editions and true firsts of the author’s most well-known work. Octavo, 2 volumes, original boards. 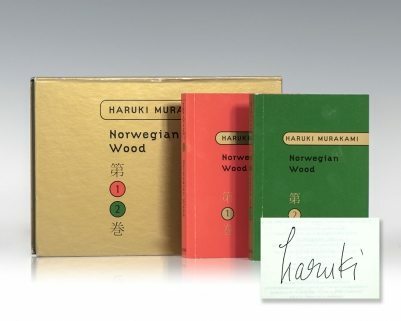 Both volumes are signed by Haruki Murakami in Japanese and both volumes are fine in fine dust jackets with the rare wrap-around bands present. Rare, especially signed. 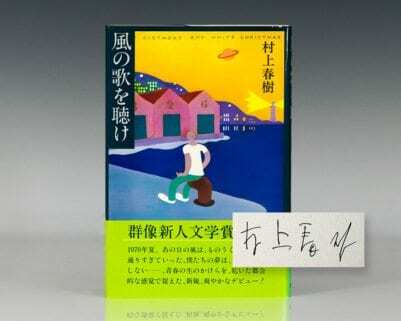 First edition in English of Murakami’s first novel. Small octavo, original wrappers as issued. Translated by Arnold Birnbaum. Signed by Haruki Murakami on the title page. Fine in a fine dust jacket with the wrap-around band present. 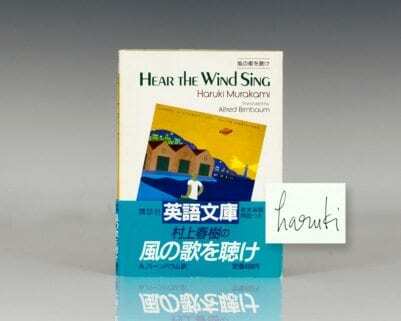 First edition of the compilation of Murakami’s first two novels. Octavo, original boards. Signed by Haurki Murakami on the half-title page. Fine in a fine dust jacket. Jacket design by Chip Kidd. Translated from the Japanese by Ted Gossen.